The Kingsport Lighthouse is located along the far northeastern shoreline of the Commonwealth, a short ways’ walk south of the town of Salem. If you want to reach the area, just start walking east from Sanctuary until you hit a huge body of water. You’re more or less there. The Lighthouse, being rather tall, stands out fairly well as a landmark, and should be easy to find. As ever when facing Children of Atom, radiation-proof equipment is best. Power Armor with a HAzmat Suit underneath will shrug off all of their Gamma Gun attacks. Go with a third-person view. Gamma Guns are really annoying to try and see through. Stealth is probably your best option. The Children of Atom aren’t wearing helmets, so silenced head shots will make quick work of them. You can do this either from a distance or close up, though given how penned-in the house is you’ll probably have to enter eventually. Watch out for a trap on the second floor, right by the stairs. If you start shooting you’ll bring most of the enemies out at you. This open method is more dangerous, as it leaves you vulnerable to attack from the dude up in the Lighthouse, as well as whomever’s throwing those stupid Nuka Grenades. Keep your distance, draw the enemy out of the house, and take them one-at-a-time. A companion is wise for tackling this place in order to draw enemy fire. Kingsport Lighthouse is a fairly fierce battle, but it won’t take too long, and the spoils will be yours thereafter. The house and the boathouse aren’t terribly interesting, aside from some everyday crafting items and an Advanced wall safe on the first floor of the house. Search the Lighthouse itself and, in the locked room containing the light, you’ll find a Mini Nuke along with an ammo trunk and some dead guy. (Also, potentially, the Glowing One.) At the base of the Lighthouse is a Workbench, and you probably know what that means by now. You won’t find what you need here to create a Generator, and, by extension, a Recruitment Radio Beacon. There’s little to no Copper and / or Gears in the place. 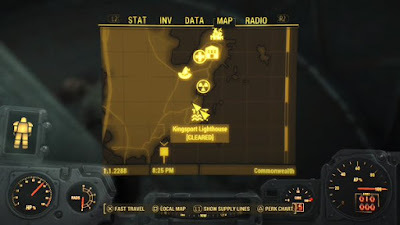 Either check nearby buildings for other items you can pawn off or head to a different settlement and send somebody here to set up a Supply Line. The front of the house is pretty much an ideal place to set up your defences, and one line of Turrets should more or less do it. Supplement with manned defensive placements if you really feel the need. Water is no problem here, given that you’re rammed up against a shoreline. A Generator and one of the advanced pumps will set your guys up for life. Food, however, is an issue, as there’s none of it here, and when you do get some you’ll probably want to stick it in the soil out front, right in the firing line. Put your garden out back between the Lighthouse and the home instead. There’s a bunch of radioactive barrels at the end of the pier by the boathouse. Prioritize trashing these stupid things. Don’t neglect the Lighthouse and the boathouse as places to put beds. Both are pretty okay at housing settlers. There are perma-bodies in the house and on top of the Lighthouse. Get rid of ‘em. That’s gross. Before we finish up, it’s worth noting that Kingsport Lighthouse is a short northward jaunt from Crater House, another Children of Atom enclave on the same beach. You can’t settle this place, mind, but if you’re already equipped to fight these guys… why not?